First, we should define what we mean by buried IN the basilica. This would include the main floor of the church which most people visit, but also the grottoes one level below. In the case of one of the six women, it also includes a stairway above the main basilica floor. Additionally, we have to clarify the term: buried. This would mean that the earthly remains of a person, and not just a partial relic, are placed in a repository. With a two thousand year old martyr found in the catacombs, what remains of the remains might only be a few bones. The confusion with the numbers, is perhaps because there are three monuments in St Peter’s in honor of women, and three women buried in the grottoes. The monuments are for Queen Christina of Sweden, Maria Clementina Sobieska and Matilda of Canossa. Of these three, only Matilda’s is a tomb, as the others do not hold the remains. Matilda, who died in 1115, was a powerful countess in northern Italy and great patron of the papacy. 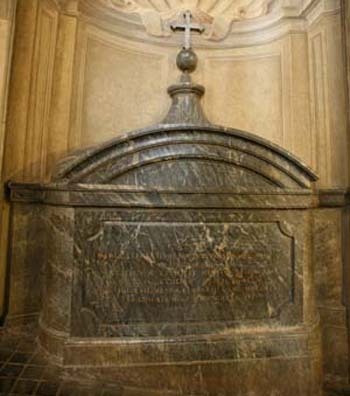 Her monument by Bernini, displays a sarcophagus carved with the Submission of the Emperor Henry IV to Pope Gregory VII at her castle in Canossa. Urban VIII had a great veneration for the memory of Matilda, and had her relics moved to St Peter’s in 1634. If Matilda has the only tomb monument on the basilica floor, we might ask where the bodies are buried of Queen Christina, and Maria Clementina whose monument also gives her the title of queen (Latin: Reginae). Queen Christina is easily found in the grottoes under St Peter’s. 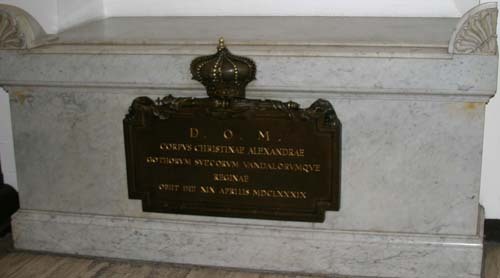 The bronze plaque on her sarcophagus states: Here lies the body of Christina Alexandra / Of the Goths, Swedes, Vandals / Queen / Died 19 April 1689. Her tomb received more notice in recent times as it was next to that of Pope John Paul II, until he was moved up into the basilica in 2011 after being declared Blessed. Maria Clementina sarcophagus Finding the resting place of Maria Clementina, wife of James Stuart, Pretender to the English throne, takes a bit more effort. At her death in 1735, her body was placed in the grottoes. In 1745, it was moved above her monument on the staircase descending from the roof. Few people will notice this tomb, because most take the elevator down after visiting the cupola, instead of walking down the spiral staircase. A Latin inscription marks the spot: CORPVS / MARIAE CLEMENTINAE MAGNAE BRITANNIAE REGINAE. One of the six women is considered a saint, and has a dedicated altar. 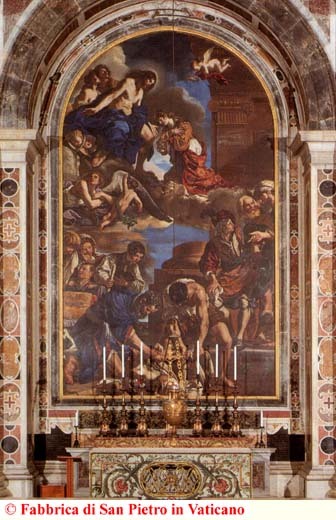 St Petronilla's altar is in the northwest corner of the basilica, near the area reserved for confession. Stories stating that she was St Peter’s 'spiritual daughter' are perhaps due to the similarity of names. Though the date of her death is uncertain, she was on the early lists of highly venerated martyrs. 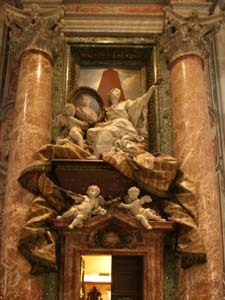 Her ancient relics were translated (moved) in 1606 to an altar named in her honor in the new basilica. Her altarpiece, showing both her burial and entrance into heaven, is considered a mosaic masterpiece. St Petronilla is also the first of the six women to be buried at St Peter’s, as her remains came from the Catacomb of Domitilla in 767, to a circular building attached to the south transept of the old basilica. This building became known as the Chapel of St Petronilla, was associated with the French crown, and in 1500 it was the first location of Michelangelo’s Pieta. Of the final two tombs, one is tucked away while the other is easily viewed. 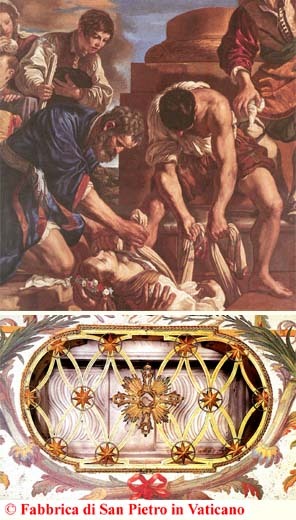 Charlotte, the Queen of Cyprus and titular Queen of Jerusalem, is buried in the grottoes in a white 20th century sarcophagus, viewed across the aisle from Queen Christina. 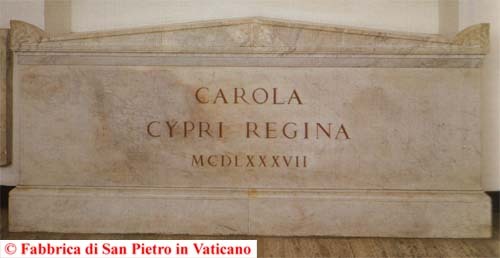 The inscription on the front reads: CAROLA / CYPRI REGINA / MCDLXXXVII. She succeeded to the throne at age 14, upon the death of her father in 1458. Forced to flee Cyprus in 1463, she died childless in Rome in 1487. Buried in old St Peter’s Basilica, her remains were moved in 1610 to the grottoes. Agnesina Colonna tomb The tomb that few know about or visit, is that of Agnesina Colonna. She was the wife of Onorato Caetani, the general of the papal infantry in the Battle of Lepanto (1571). 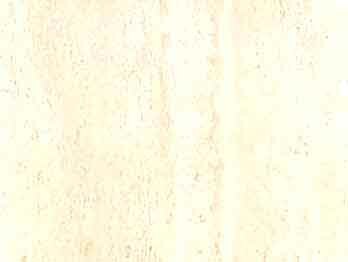 Her elegant tombstone is on the wall in the Chapel of the Patron Saints of Europe. This chapel on the north side of the semi-circular corridor in the grottoes is not accessible during the day, being only open for private masses in the morning. Agnesina, who died in 1578 and was buried in the basilica, was more than the wife of a famous general. She was a noblewoman of the powerful Colonna family and two of her sons became cardinals. Some may reasonably question whether it’s important if three or six women are buried here. St Peter’s contains a nearly inexhaustible amount of detail, making it easy to overlook a few items. But fact checking is part of history, and we want to trust the sources to get it right. We have a saint, three queens, a great countess and a noblewoman, but if we only hear about three of these women, we’re only getting half of the story. St Petronilla - (d.1st-3rd C.) Relics moved from catacombs in 757 to old St Peter’s, translated to her altar in 1606. Matilda of Canossa - (d. 1115) On 10th March 1634 her relics arrived in the Basilica, and placed in her monument. Charlotte of Cyprus - (d. 1487) Buried in old St Peter’s, moved in 1610 to the grottoes. 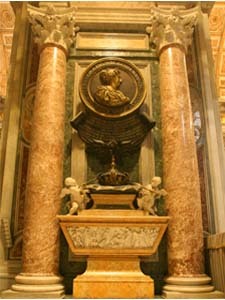 Agnesina Colonna Caetani - (d.1578) Buried in the basilica, moved to Chapel of the Patron Saints of Europe. 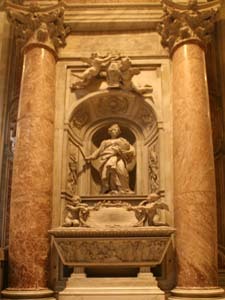 Christina of Sweden - (d. 1689) Tomb in the grottoes, monument in the basilica. Maria Clementina Sobieska - (d. 1735) Buried in grottoes, in 1745 moved above her monument.